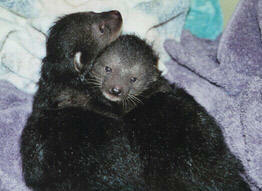 Ferret kits are best raised by their mother or a foster jill. If that is not possible, hand raising may be necessary. Be prepared for sleepless nights! For most people, ferrets are wonderful slinky pets. Just having one is enough. But for some, breeding becomes an interest. Before you do, you may want to read the story What You Should Know About Breeding Your Ferret. At birth, ferret kits are completely vulnerable and need the care of their mother or a foster to survive. If a jill is unable to care for her kits due to illness or death, try to find a foster lactating ferret. Most jills will readily accept other kits if they are already nursing a litter. If this is not an option, hand raising is necessary. Be aware that people are not the best substitutes for ferret moms. Orphan raising can be difficult and unrewarding. If a foster ferret is not available, have plenty of ferret replacement milk on hand and be prepared for many sleepless nights. Ferret replacement milk can be made by mixing 3 parts puppy milk replacer and one part whipping cream. Feed the kit as much of this warmed mixture as he/she will take. Offer this mix at least 4 times a day from a dropper or pet nurser. More frequently is even better. At 3 weeks of age, moistened solid food can be introduced to allow the kit to explore and nibble. Continue to offer milk as well as ferret chow until the ferret is at least 4 weeks of age but continuing until 6-8 weeks of age is recommended. Weaning can safely be done at 6-8 weeks of age. In addition to feeding, kits must be kept warm. Chilled kits should not be fed until they are warmed up. Keep the kits near a warmer or heating pad but make sure there is a portion of the enclosure that does not have the heating pad, to allow the kits to get away from the heat if they wish. For the first 2 weeks of life, the genital area will need to be stimulated with a warmed wet cotton ball to induce urination and defecation. After 2 weeks of age, the kits are able to eliminate on their own.